For more information, please contact listing agent Heath Gran 605-209-2052 or Scot Munro 605-641-6482 with Great Peaks Realty. New construction 5 bedroom cabin being built at Terry Peak! Beautiful large windows off the front with an open deck with views of the Hills! 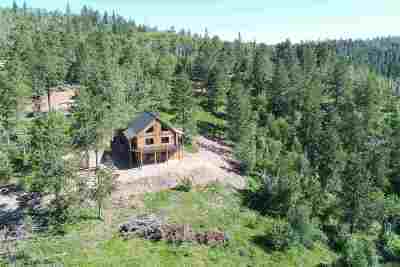 Inside features an open concept layout, rustic wood logs, vaulted ceilings and an open bedroom loft. Main level features 2 bedrooms and 2 baths. Spacious basement offers two additional bedrooms, family room with walkout to the covered patio. Here is your chance to own your personal cabin getaway or vacation rental investment!